Solo Explorer 1.0 free download. Solo Explorer is a wav to MIDI conversion, automatic music transcription (recognition), and score editing software for Windows. It extracts music score out of the the monophonic audio records. You can display, play, edit, and save your music. Solo Explorer supports both prerecorded Windows PCM and direct audio input. It has simple and easy-to-use interface. PDFtoMusic is an innovative application that converts PDF score files into music PDFtoMusic Pro embeds all the features of PDFtoMusic, plus advanced options like MusicXML export. 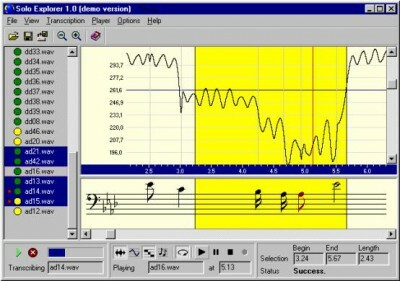 Mobile Music Pro is a ringtone composition and converting software. 7Canaries Standard performs automated recognition of polyphonic music, stored in MP1, MP2, MP3, MPP, MPA, AIF, SND, AU, WAVE formats as well as audio CD tracks. WIDI Recognition System is a polyphonic Audio to MIDI converter with extended options.